This small sized mini keg is conveniently shaped so it will fit into most coolers/eskys. This size will also will fit most standard domestic fridges so it's easy to store without having to buy a new fridge. The 5L size is equivalent to 15 x 330ml Bottles of Beer. 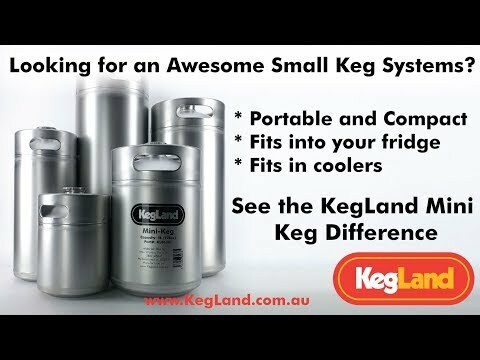 The KegLand Small Stainless Steel Mini Beer Kegs are specifically designed for home brewing/growler dispensing. They are suited to small batches and suited to people who want to fit them into their standard domestid fridges. You can naturally carbonate using priming sugars or preferably force carbonate and serve your beer with the ball lock lid (Part: KL06972). The Mini Kegs are made so they convenientlyu fit into a standard domestic refrigerator. Due to the fact that these kegs use a flexible silicone dip tube/spear the kegs can also be dispensed on their side or upright so irrespective of what is the most convenient orrientation in your fridge you can stand the keg up or lie the keg down and the dip tube will always sink and draw liquid from the bottom (as it's heavier than beer). Unlike many other mini kegs these mini kegs use the gold standard acid bath electrolosis to pacify the stainless steel making the more resistant to rust than any other mini keg on the market. These mini kegs are the ONLY mini keg where we use a special technique whereby we weld the kegs from the inside out. This means we get a superior welding finish that is more sanitary than any other mini keg available. So if you are looking for the highest quality mini kegs that money can buy, this is what you have been waiting for! Although there are many other mini kegs that come from China simply none of them have the same quality and finish as the genuine KegLand minikegs. The Mini Kegs are also have various other accessories such as neoprene jacket, compact tapping systems and other stuff that you might find useful too.